The Engineer collection was originally developed for engineers working on America’s railroads. The boots with pull-on styling, used minimal stitching to protect the engineer’s feet from the hot embers that fell from the locomotive’s firebox. The buckled side gusset at the top of the boot allowed for easier bending, a necessary requirement as they needed to continuously shovel more coal into the firebox. The first engineer boots, number 919, appeared in the 1941 catalog—they were advertised as pull-on boots for engineers and truck drivers, the new engineers of the open road. 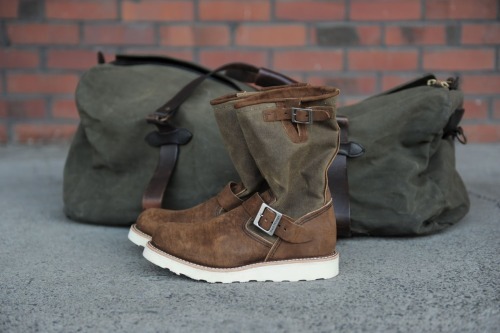 What do you think of the Red Wing Limited Engnineer Boots? Heel erg cool. Red Wings zijn geweldig!